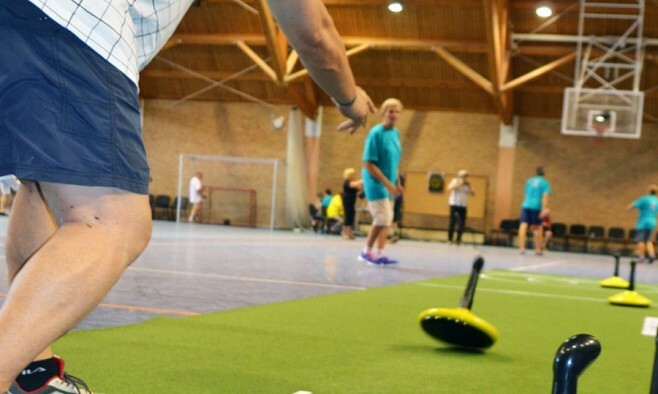 The eighth edition of the Parkinsoniada took place in Czech Republic from 31 July to 2 August and attracted around 250 people with Parkinson’s – along with some affected by multiple sclerosis – ­to take part in the sports games. Male and female players from the Czech Republic, Slovakia, Austria and Poland competed across 10 events, including table tennis, throwing, shots on goal (hockey or soccer), curling and bowling. Age is no obstacle at Parkinsoniada; one of the oldest participants was a Slovak man (87) and a Czech woman (80). In contrast, the youngest were in their 40s. The opening ceremony began on the Friday in the main square in Hodonin, a town located very close to Brno, with speeches from Parkinsoniada founder, Jan Škrkal, and the mayor of Hodonin, Milana Grauové. Although I’ve attended the Parkinsoniada before, the joy and energy that the patients – often despite severe disability – put into the competition made a great impression again. Their motivation to give their all from start to finish, trying to understand others despite the language barriers, while encouraging and comforting each other was lovely to see. Interestingly, those who looked less affected and more fit outwardly weren’t always the most successful. As usually the games were well organised, with the help of volunteers, and it culminated in the medal ceremony. The greatest admiration is reserved for the perserance of all the participants in overcoming their condition. Particularly impressive was the fact that they attented this whole day event in the hot summer heat, and after a long time spent travelling the day before to reach Hodonin. In between the events, there was always time for entertainment in the form of concerts by a female folk choir from Dubňany and the men’s choir from Dúbrava, of course, accompanied by dancing. The breaks are also an opportunity to meet and make contacts with patients, carers from other countries. Every games is supported by an exhibition to raise awareness of the disease. This year it told the individual stories of those diagnosed at a young age. This international meeting of people with Parkinson’s disease was founded by Jan Škrkal, president of Parkinson Slovácko o.s., who has lived with Parkinson’s for more than 10 years. The event’s principle aim is to support the will to overcome obstacles, to restore confidence in one’s own abilities and to develop the habit of regular exercise. Leszek Dobrowolski is president of the Warsaw Regional Association of People with Parkinson’s Disease. It sounds fantastic! Could someone please provide me more info about Parkisoniada? Let say Parkinsoniada website is website of organizer “Parkinson Slovacko o.s.”. It is in Czech language. people who only know English. Recently we try to make more attention on Parkinsoniada in other region of Europe than Slovakia, Austria or Poland.